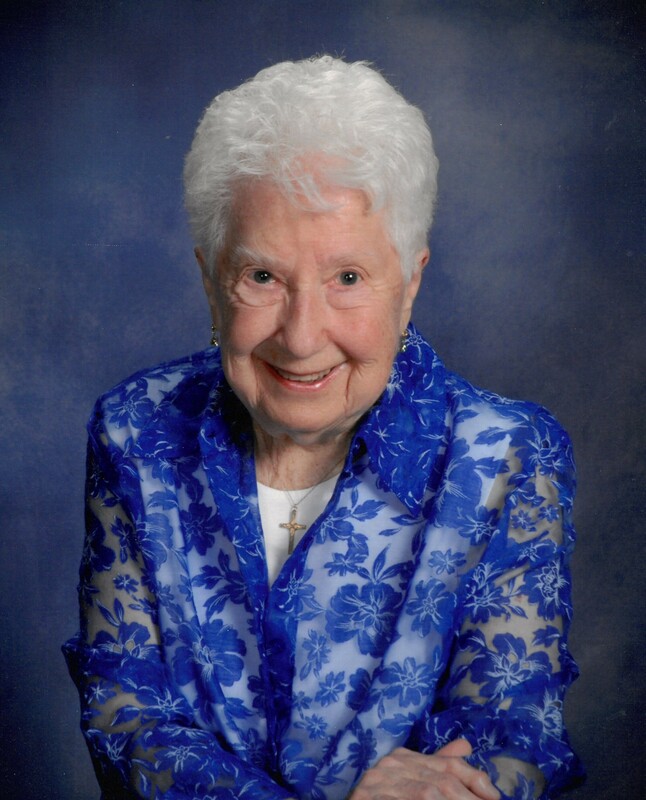 Florence “Flossie” Christiansen, age 97, of Wells, passed away at home on Thursday, April 11, 2019. Florence was born December 19, 1921 in Birch Run, Michigan, the daughter of Daniel and Elizabeth (Fischhaber) Knieling. She was united in marriage to Randolph Christiansen on July 22, 1941. Florence was a member of Our Savior Lutheran Church in Wells and worked as a waitress for the Family Inn for 38 years. She had a wonderful sense of humor and enjoyed spending time with family, playing cards, camping and knitting. She often knitted items for her family as well as the Salvation Army and other charities. Among her many activities, Flossie especially enjoyed watching her grandson Tommy’s hockey and baseball games. Florence is survived by her daughter, Amber (Les) Delvaux of Wells, step-daughter, Greta (the late William) Strong of Saginaw, MI; grandson, Tom (Wendy) Jones, step-grandson, Bob Strong, great grandchildren, Gabriella, Alexis and Logan Jones, step great grandchild, Willa Strong and numerous nieces and nephews. She was preceded in death by her husband, Randolph in 1997, her parents, brothers, Herman, Carl, Norman and Walter, sisters, Alma Letzkus, Linda Fox, Margaret LaMountain and Emma Gugel and a step-grandson, Will Strong. The family will receive friends on Monday, April 15 from 3:00 PM to 6:00 PM at Our Savior Lutheran Church in Wells. Funeral services will follow at 6:00 PM with Pastor Al Schubert officiating. A luncheon will be served in the fellowship hall. Florence will be laid to rest in the Gardens of Rest Cemetery in Wells. My condolences on the loss of your Mother. What a lovely lady & how blessed you’ve been to have her in your life for so many years. Flossie was such a cool lady, such an important, lively part of the neighborhood! She always had a smile on her face and I remember her walking to work and the post office and she was just always out and about. Flossie and Mrs. Sarasin taught my mom and I to play Canasta. She told the funniest stories, one time telling me about how “polluted” she and my Grandma Ina were. She will be missed! Please know that my thoughts and prayers are with you. I would be there but I am away on vacation. She was such a sweet lady. Amber our heartfelt condolences in the passing of your dear Mom. She certainly was a joy to so many people. I always remember the stories my Mom shared of them working together. They had so much fun. I’m sure it made their hard work light.